This mysterious woman can use souls to level up an undead. She hands the player an Estus Flask at their first meeting and later on gives the Aged Feather at Dragon Aerie. I want you to kill someone of import. They say that she is the last Fire Keeper. lighting the way for you cursed fools. Nonsense. and I will be content to remain here. The girl will have a peculiar feather. She is near the bonfire. She stands at the bottom of the stairs that lead to the Castle's entrance. She looks at the Aerie, easily noticeable when coming out of the elevator which leads to this area. She stands to the left past the Drangleic Castle King's Gate, before the long path leading to the throne. She can level up the player's stats with the use of the player's current souls. She hands the player the Estus Flask. She can increase ther number of Estus Flask via Estus Flask Shards. She can be killed, so be careful. If you kill her you will have to pay 2,600 souls at her grave to level up. Her grave spawns near the tree after killing 3-6 bosses. If you strike her enough times she will aggro, but she does not attack or move. You simply cannot speak to her or use the bonfire near her. She changes poses each time you rest at the nearby bonfire or reload the area. She reveals her true name is Shanalotte in her final dialogue. If you look closely under her hair to see her other eye you will notice that it is blue. 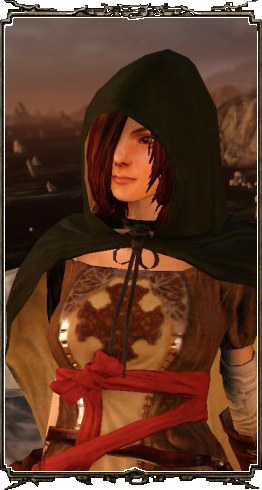 This means the Emerald Herald has heterochromia. This NPC has many unused dialogue lines. Or… Merely a pawn of fate? Take this with you. May it ease your journey. Go on, and see the King. He who made Drangleic what it once was; he who peered at the essence of the soul. For misery will lead you to greater, stronger souls. You will never meet the King with a soul so frail and pallid. Seek those whose names are unutterable, the four endowed with immense souls. Their souls will serve as beacons. Once you have found them, return here to me. Seek souls. Larger, more powerful souls. Seek the King, that is the only way. Lest this land swallow you whole… As it has so many others. Is that a shard you've found? Here, let me see it. So that I may help you. You have acquired the soul of an Old One. That is more than most Undead can say. The soul and the curse are one and the same. Your soul has grown stronger still. I only hope it brings you what you wish. Proceed, bearer of the curse. It is the only choice left to you. You are blessed with a myriad of souls. Bearer of the curse, make your way to the castle. Bearer of the curse. I will always be at your side. Over the hill and past the forest is the King's castle. Where a man peered straight into the essence of the soul. Those who come to Drangleic seeking salvation soon lose hope, and turn Hollow. It happens to them all, sooner or later. That blue knight at the base of the tower… His spirit is already broken. Although he does offer sound advice. Perhaps he is a foreshadowing of your own future? An ancient being that will mock your very existence. And without souls, you will turn Hollow. Stay strong, do not lose hope. Even when you have precious little time. For when the Undead dies, it is never truly dead, but only one step closer to Hollowing. Not all Undead are Hollows, but all Hollows were once Undead. If you find an Estus Shard, bring it to me. So that I may ease your burden. If you proceed regardless, your fate will be more terrible than mere life or death. But I will not stop you, if that is your heart's desire. But nonetheless, you must forge on. To bring an end to your journey…and mine. This ring is the symbol of the King. Long have I awaited one such as you, one who might shatter the shackles of fate. One who can set me free. Bearer of the curse, it was my own manifestation that led you here. The ancient dragon has watched over the world for aeons past. Do not resist. The dragon welcomes you. My journey is already complete. The dragon gave me this name, for I was born with none. I was born of dragons, contrived by men. By ones who would cozen fate herself… They are the ones who created me. I did not come out as intended. Fate would not be bested, and men were cursed once again. If you proceed, Nashandra will come after you. Knowing that you will take the throne, and link the fire. She covets the First Flame, and the Great Soul. Great Sovereign, take your throne.